The table is set! I was able to get the table ready for Patrick's arrival but then he got put to work in the kitchen. Good thing we enjoy cooking together! For our meal we used the salad plate for the appetizer and the rimmed soup bowl for the entree which means I was able to set the dinner plate as a charger. We had white wine with dinner so we used the white wine and all purpose (for water) stemware. In the back of the picture you might see the little yellow bag of sweet goodies that is to come later. While planning the two month anniversary meal I really wanted scallop risotto! But we had so much butternut squash that I thought butternut squash risotto would be more appropriate. So the scallops got bumped up to the appetizer! Win-win! I found a scallop salad appetizer by Gordon Ramsey with a wonderfully light dressing. The salad also included julienned apples which gave it a nice crunch. I used the recipe found here on the wholesomely homemade blog. As mentioned in the appetizer section, I had lots of butternut squash from our CSA and knew it would be a great addition to risotto. I knew that because we've made butternut squash risotto before: see here for the recipe and other links to past risotto dishes. Our sweet dessert was provided by Godiva. Dessert isn't always my forte and I find it hard to make dessert in small portions. I don't like making cakes or pies and wasting it after a few slices. So off I went to the Godiva store for some truffles. They are the perfect ending to any fine or casual meal! On this particular evening we had pumpkin, tiramisu, chocolate lava, and cookie dough truffles. So after our month one anniversary dinner I knew that using the china would be a task if I needed to wash it before each meal and then box it up after we were done. When I was working at the registry desk I mentioned to the Lenox representative who visited our store that I was looking forward to using our china but would probably keep it boxed up the first year. He highly recommended keeping two place settings accessible in the kitchen cabinets. We have very little kitchen cabinet space and this just wasn't feasible. We visited Washington DC at the end of September. I was attending a shower in honor of our October bride Christine! On the way home I insisted on an Ikea stop. At Ikea we discovered the Besta storage collection. 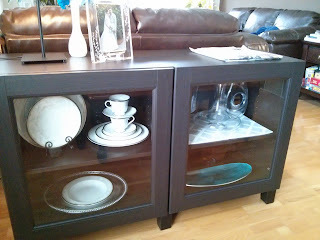 We purchased one of the shelf units (it's a media storage collection) with glass doors. 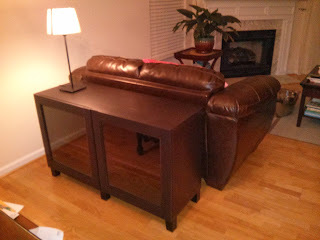 The unit sits right behind our loveseat facing the dining table. Patrick was afraid it would take up too much space but it really doesn't it. Looks like it was made it to go there! Here it is the night we assembled. Setting up the unit here also enabled us to put a desk lamp which means more soft lighting in the room which has turned out to be a real plus. Here it is with the china in it on the left and some other entertaining pieces on the right. Currently I am just storing two place settings here so it's easily accessible for monthly anniversary dinners. We agreed to purchase the unit because it is a transitional piece as well. We will be able to use this in any future room for storage and not be limited to china. Your table setting was beautiful. The green salad looks so pretty on that china. I am so glad you and Patrick are enjoying all your wedding gifts and cooking together.